While we all look forward to the holidays, chances are that parents of newborn babies might be feeling a bit stressed out about the logistics of holiday travel right now. Making a journey and staying away from home are not the easiest when you have a baby to bring along with you—and while helping your little one adjust to new surroundings, dealing with time differences and avoiding any mid-flight meltdowns are all very real worries, there's one challenge we don't always consider right away when we're planning our first trips as new parents: How does one travel with all the equipment your baby will need while you're away? The simple answer? It might be easier not to lug a car seat or stroller on that flight with you. Instead, you could consider renting that equipment—and with this app, which is being hailed as the "Airbnb for baby equipment," that just got a lot easier. 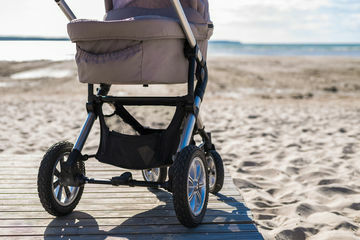 New York-based mom Natalie Kaminski founded goBaby after realizing how stressful it can be to travel with young children, according to a release announcing the app's launch. "Packing and carrying the equipment you need for your kids can add a lot of physical and mental work to family vacations,” said Kaminski. “Bringing strollers, rockers and bouncers with you to your destination just isn't feasible. We created goBaby to take the pain out of traveling," Kaminski said. Here's how it works: goBaby curates a marketplace of parents who offer up their equipment for other parents to rent. According to the team, goBaby takes measure to ensure the equipment is all safe, in good condition and clean. The app has launched in New York, and travelers can search for specific pieces that are available on certain days in specific locations. Parents and renters work out a pickup/delivery arrangement, payment is exchanged, and parents are free to use the pieces for a specified time range before returning them. This could represent a really great options for locals and tourists alike: For obvious reasons, visitors can benefit from renting equipment as opposed to traveling with heavy pieces or shelling out cash on new items. Those who use the service to rent out equipment can pick up some extra cash—it seems like a win/win, doesn't it? Would you use an app like this? If so, feel free to download it right here—and hope for it to expand to additional cities soon!